Biodesix said today that its VeriStrat proteomic blood test has shown its prognostic value for patients with non-small cell lung cancer (NSCLC) in a recently-published study. VeriStrat showed itself to be a significant predictor of outcomes, independent of clinical variables that included ECOG Performance Status categories, epidermal growth factor receptor (EGFR) mutation status, and treatment received in patients enrolled in the Phase III MARQUEE trial (NCT01244191). 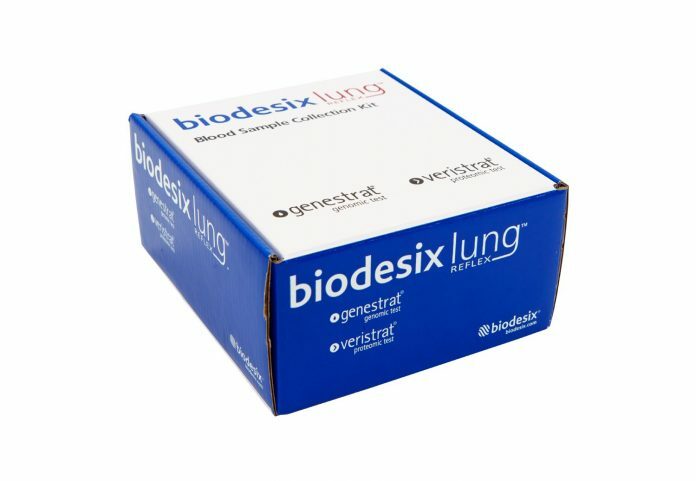 VeriStrat—part of the Biodesix Lung Reflex test kit along with the GeneStrat genomic test—is a multivariate, mass-spectrometry based test designed to identify a chronic inflammatory disease state associated with aggressive cancer by measuring circulating proteins in the blood serum or plasma of patients. Test results classify patients that are more likely to benefit from standard of care treatments (“VS Good”) or that may benefit from an alternative treatment strategy (“VS Poor”). According to the 1,048-patient trial, patients with VS Poor results using VeriStrat and a better ECOG performance status have worse overall survival compared to patients with VS Good results and a worse performance status. VeriStrat was also demonstrated to be applicable to predicting response differences in EGFR mutation-positive patients as well as those that are EGFR wild-type, Biodesix said. The study also showed that in the EGFR mutation-positive subgroup, patients with a VS Good result experienced improved overall survival as compared to patients with a VS Poor result when treated with a single-agent EGFR-tyrosine kinase inhibitor (EGFR-TKI). When the combination of two EGFR-TKI therapies was used, patients with VS Good results still outperformed those with VS Poor results, but those with VS Poor results performed better on the combination therapy than on erlotinib alone. These results indicated the need for an alternative treatment strategy, which may include novel combination therapies, according to Biodesix. In contrast, the patients with a VS Good result did not receive significant benefit from the additional agent, Biodesix added. “This analysis provides further evidence that VeriStrat testing can enhance the prognostic evaluation of patients with advanced NSCLC and guide patients and physicians in making effective treatment decisions,” Linda Traylor, Ph.D., VP of clinical development and medical affairs for Biodesix, said in a statement. The study, “Retrospective Assessment of a Serum Proteomic Test in a Phase III Study Comparing Erlotinib plus Placebo with Erlotinib plus Tivantinib (MARQUEE) in Previously Treated Patients with Advanced Non-Small Cell Lung Cancer,” was published August 23 in The Oncologist by an international team of researchers led by corresponding author Giorgio V. Scagliotti, M.D., Ph.D., of University of Torino at San Luigi Gonzaga Hospital in Turin, Italy.